My Pants is a very special boy (of course I think so, I am his mum). He hasn't always been the easiest of children but always makes me smile some how! I am not sure where my children get this strong will from but its not me. Pants has always been the child that stands out if a group of children, and always the one that gets caught first being naughty. He knows what he wants and will try his hardest to get it. With this starting school was very hard for him, suddenly this boy so full of energy has to sit down and hold a pencil. He hated it and often would ask to stay at home. Before he started school sitting down for long periods was hardly done unless it involved food. Getting Pants to do craft or anything like that was a hard task. He had no time when he could be running round or playing. So after the first few weeks I had his parents evening, there was me thinking nothing of it just chatting to the teacher to find out how he was doing. Sadly it didn't turn out how I thought it might, his teacher at the time had nothing positive to say about him, saying he was disruptive, naughty and most defiantly had a behavioral problem such as ADHD. I was shocked I knew he was not a child who liked to sit down but ADHD surely not. I left and walked down the road and cried my eyes out, not because I was ashamed but because who wants to hear bad things about there children. I told my husband about it he was supportive and suggested that we would pray into the situation. The teacher had asked me if I wanted Pants to be tested, I was unsure, I didn't want my child to be labeled, but on the other hand wanted him to get the support if he had a behavioral disorder. I myself have dyslexia and poor concentration so thought maybe he just takes after me. had improved and there was no mention of ADHD, but her comments were Pants talks to the teachers as if they are his friends and has no boundaries with staff. 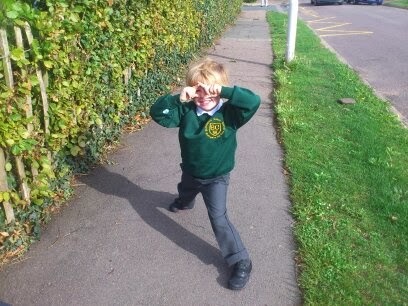 Pants moved to year 1 and they split his class up and since then he has gone from strength to strength. His year 1 teacher got behind him and encouraged the things he enjoyed. She praised the things he was good at and for once he enjoyed going to school. Then another year later I turn up to parents evening no idea what they are going to say. Pants doesn't mention much when coming home from school and I have not had any calls from the teachers regarding behavior. I was so surprised to find out Pants is above average in all his subjects and is a star pupil in the class. They said he is bright and a joy to teach one of there favorites. I was taken a back I mentioned his year R parents evening and they said they couldn't see any behavioral problems at all. God has worked wonders on Pants I am so proud of what he has achieved so far. I love Pants, he may not have the cuteness factor now he is growing up but there is something in him that shines. Something that makes him special and unique I hope we can channel this right as he grows up. He is so funny and makes us laugh with his funny antics he makes me a happy mum (most of the time) He is also a very patient big brother putting up with being attacked by an excited little sister on a regular basis! Well Done Pants! Waiting waiting waiting for a baby to arrive! 39 weeks pregnant plus a few days!